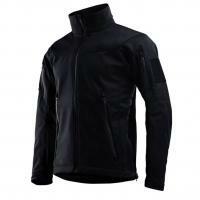 Tru-Spec's "Gunny-Approved" tactical softshell jacket provides lightweight, unobtrusive protection from the elements. The flexible polyester fabric is treated with a DWR-durable water resistant finish to keep the wind and rain out, but also stretches enough to allow wear with holstered firearms or body armor. The zip-through collar includes a fleece lining for extra insulation and comfort, while the cuffs include hook and loop adjustment for a snug fit. The waist adjusts using a cord lock that can be operated one-handed. The jacket includes plenty of storage space for smaller accessories, with two mesh-lined covered waist pockets and two lower back pockets. A pair of shoulder loop patches make it easy to attach identification tags and other markings.